Stirrup pants (or stirrup leggings) are a type close-fitting ladies' pant that tapers at the ankle, similar to leggings, except that the material extends to a band, or strap, that is worn under the arch of the foot to hold the pant leg in place. The band of material is often elasticized to prevent the material around the foot from tearing. Stirrup pants were originally sportswear for women, and remain sportswear for horse riding and skiing. However, they have come in and out of fashion during the 20th and early 21st centuries, peaking in popularity as street fashion during the 1980s. Stirrup pants became a popular casual fashion for women in Europe and America from the mid-1980s to the early 1990s. Leggings in general became fashionable streetwear during the 1980s, as did sweatshirts, leg warmers, and other items that originated in sports and dance studios. Stirrup pants were originally worn as breeches for horse riders. The purpose of the strap under the foot was to hold the pant legs in place in the boots of the rider. 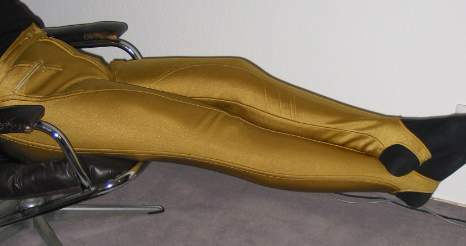 Stirrup pants for skiing were introduced at the 1936 Winter Olympic Games in Germany. Do you think that this is a fashion trend that will return in the near future? Learn about other pant styles.